I mean, for the past few years the topic has been covered—exhausted actually—by every trade pub, agency, consulting group and even the mainstream news. Everyone has advice on how to market to this supposedly unique generation. While there are certainly some important behavioral differences, the truth is, millennials are a lot like other generations. In a recent Epsilon research report, we found that the key to marketing to millennials is realizing that age alone doesn’t determine behaviors, life stage does. The lesson: You need to move beyond traditional age-based segmentation. Sure, knowing basic demographics (including age) are helpful, but you have to do better than that. Instead, focus on developing insights built around psychographics, motivations and behaviors associated with life stage. Take on the challenge of better understanding your consumers’ needs, attitudes and behaviors. You need to get personal. And even more specifically, you need to understand what your millennial consumers’ value. Knowing this level of detail about consumers means you can speak to them in the right way and at the right time with relevant messages, content and offers. It is well-known that millennials—broadly speaking—tend to be more experience-minded, socially-adept and environmentally-attuned. They are also less promotionally-sensitive or financially-motivated than prior generations. When it comes to CPG, however, millennials who make their own purchasing decisions tend to seek brands that can offer it all: experience, authenticity, social responsibility and a good health profile. Even better if it’s a good value. This poses a tremendous challenge to you, as CPG marketers, to create products and marketing programs that satisfy all of these things and provide a good value to increasingly financially-challenged consumers at the same time. 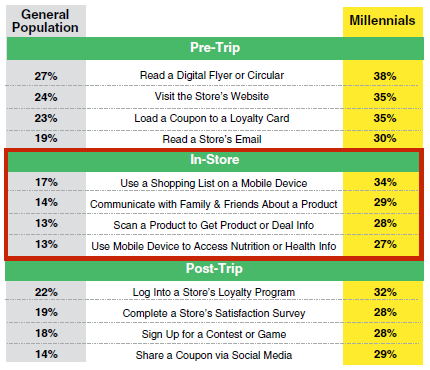 Millennial CPG consumers really do want to have it all, and they believe it’s possible. Now that we’ve discussed millennials and what we know about them from a value standpoint, let’s discuss actual grocery shopping behavior. This is where you understand where and how to engage them with offers and messages that align with their values. When talking about shopping behaviors, we have to look at the impact digital—mobile in particular—is having. While overall trends are not totally different than other demographic segments, millennials use digital at even greater rates. As millennials continue to grow up, digital will play an even more important role in the grocery purchase cycle. Of particular note is in-store mobile use. Millennials are at least two times more likely to engage via their mobile phone on their path to purchase than the general population. Now that’s influencing purchase decisions. To bring it all together from a CPG perspective, we’re just at the beginning of this. The influence digital has on the CPG still pales in comparison to other industries—such as apparel and consumer electronics—but as you can see from the chart below, driven primarily by millennials, digital use to influence shopping of food and beverage categories is growing at a 7 percent clip (exceeded by only 1 point by health and beauty). Those who have traditionally led are shrinking…for the moment. What this tells us is that we’re seeing changes in the CPG marketing space, and that there are no signs of slowing. Millennials are generally leaning heavily toward digital and you have to be prepared to address that in innovative ways. Now let’s bring these concepts to life with a quick case study. One of our CPG clients recently deployed a large, multi-brand email program. An in-depth analysis revealed that their bias to target “Millennial Moms” was flawed. Up until then, communication had been mainly one-size-fits-all and program performance was lagging. The study unearthed a series of sub-segments along with their specific digital behaviors, household dynamics, preferences, beliefs and association with various brand bundles which changed markedly from one sub-segment to the next. Basically, it turned out that the content being promoted was potentially irrelevant to some segments. In thinking they were targeting appropriately, they missed out on the multi-faceted dimensions of who their targets actually were (and what would most likely be relevant to them). Part of the goal of the life stage work with this client was to dispel the bias of targeting only millennials. And it did, in fact, show that life stage, and even more specifically, values, attitudes and beliefs, are of critical importance when striving the connect with and ultimately increase sales with your consumers. The results armed the client with a new segmentation strategy and the details required to personalize communication going forward. This is an important step on this brand’s roadmap to realizing a one-to-one personalization vision. If you’re a CPG marketer, I suspect your regular conversations, especially as you’re preparing for 2016, center around engaging new consumers for your brands. As our culture is changing and we’re seeing more people (especially younger people) make value-driven, health-based purchasing decisions and increasingly adopt digital channels to assist in making those decisions, we need to adapt to stay relevant. But specific to millennials, remember that this group isn’t as mysterious as the marketing industry makes them out to be. Sometimes we just create complexities for ourselves. So do yourself a favor and strive to make things simpler rather than more complicated. To see more shocking (and fun) results about millennials from our research, including the 6 primary life stages of millennials and exactly how to reach them, check out the report.